President Cyril Ramaphosa determinedly stays presidentially magnanimous, as his performance showed during the first parliamentary Q&A as head of state on Wednesday. But translating his new dawn and social compact rhetoric into action faces its first real test. 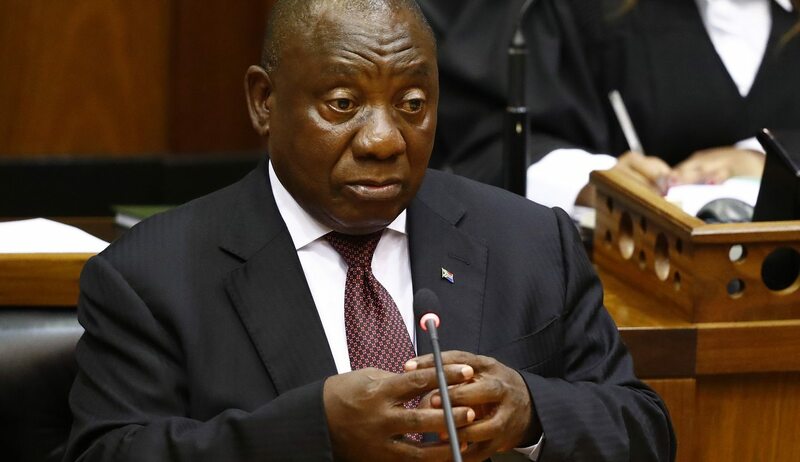 Parliament effectively has just one month to enact legislation so that Ramaphosa’s long-standing project, the national minimum wage, is implemented as planned on 1 May. On Wednesday he again styled it as reducing income inequality. There are many who disagree – and Human Rights Day will see Numsa spearhead a protest march. By MARIANNE MERTEN. A few hours before President Cyril Ramaphosa took to the podium of the National Assembly for the presidential question slot in the House on Wednesday, the labour committee finally had the National Minimum Wage Bill and related labour legislation amendments on its law-making agenda. It’s taken some 14 months to get there. On 8 February 2017 Ramaphosa, then deputy president, hailed the agreement in the National Economic Development and Labour Council (Nedlac) as “a significant advance in our efforts to address the challenges of wage inequality and labour instability” and “further momentum to our national effort to tackle poverty, unemployment and inequality”. It had taken two years to reach agreement that from 1 May 2018, the national minimum wage would be R20 per hour for all except domestic and farm workers. But it’s not straightforward. The bundle of Bills that eventually was tabled in Parliament by the labour ministry 10 months later in the dying days of the 2017 parliamentary year proposes fundamental changes to the labour law regimen. The National Minimum Wage Bill itself allows for an annual wage review, but no guaranteed increase, on criteria including inflation, gross domestic product, “ability of employers to carry on their businesses successfully” and “any other relevant factor”. It’s up to Cabinet to approve any possible increase. And already the national minimum wage isn’t quite national: farmworkers would be paid an hourly R18, not R20, from 1 May, domestic workers R15 and those participating in government’s public employment programmes R11 per hour, according to the Bill. On the table now through the related proposed amendment laws are mandatory pre-strike ballots, increased ministerial powers and changes to labour dispute resolution. In a move that effectively undermines collective bargaining, the legislative proposals include the ultimate abolition of sectoral determinations, or the setting of wages for workers in a specific sector regardless of whether they are unionised or not. The Employment Conditions Commission will be disestablished. With Friday the deadline for written public submissions, two days of public hearings have been pencilled in next week following Tuesday’s committee discussions and briefing from the Labour Department. By Wednesday only 10 submissions had been received, predominately from employers’ organisations. But Daily Maverick understands civil society organisations have put out a call among themselves to ensure their views are submitted by deadline, as trade unions are also in the process of making submissions with a view to also speak to those. Trade union federations Cosatu, the Federation of Unions of South Africa (Fedusa) and the National Council of Trade Unions (Nactu) are expected to make a joint submission, raising some issues, but not disputing the proposed laws as a whole. The fights had taken place and were resolved at Nedlac, Daily Maverick was told. Not so the National Metalworkers of South Africa (Numsa) and the federation it belongs to, the South African Federation of Trade Unions (Saftu). Neither was part of the Nedlac process, where established representatives maintained a closed door to potential new entrants. “This (national minimum wage) is a thumb-sucking compromise created to benefit the companies,” said Numsa spokesperson Phakamile Hlubi-Majola. Already employers were using the envisaged R20 hourly minimum wage as their reference point in negotiations, although Numsa recently managed to secure R43 per hour in the engineering sector. What was needed was a living wage and the protection of workers’ rights, said Hlubi-Majola, adding that Numsa would be joined by a range of civil society organisations in the Johannesburg protest against this national minimum wage on Human Rights Day. But the time crunch is on as Parliament goes on recess from the end of the month until mid-April. The legislation must be passed by the National Assembly and agreed to by the National Council of Provinces (NCOP) before the end of April for it to stand any chance of legally coming into effect on 1 May. How did it get here? It’s not quite clear, but it talks to the slow pace of governance and law-drafting within government, contributing to the disjunct between policy announcement and implementation but also meaningful consultation. However, what became somewhat more apparent during Wednesday’s presidential Q&A were Ramaphosa’s views on how government, labour and business should play together in South Africa’s new dawn of social compacts and co-operation. In response to an ANC sweetheart question on “our task is to seize this moment of hope and renewal”, the president replied that it was government’s job to create an “enabling environment for business to invest, to thrive and to create jobs… Labour should work with employers to strengthen collective bargaining, reduce labour instability and support measures to improve productivity”. That focus on business for job creation, investment and such has been a golden thread through the month-old Ramaphosa presidency. In one of his first acts, he talked to the Chamber of Mines, which then withdrew its court challenge against the Mining Charter. A few days later it was confirmed in court to also involve the six other civil society and trade union parties to the legal challenge.